Step 1: Throw T322 to move train from block B321 to B322. By default, B322 power is tied to the mainline, and the 322 toggle on Mountain Panels 1 or 2 can be used to dictate which DC throttle 1 or 2 is used in the block -- obviously the same as B321. Step 2: Realign T322 once the train has fully entered the B322 interchange track. Step 3: Throw T324. The “Aux contacts” on the AC (Angels Camp) switch machine side of T324 change. This powers block B322 from the branchline block B830. The desired DC throttle can be selected on the Branchline Panel (choices are Mountain, Off, or Branch). Step 4: Realign T324 once the train has fully entered the B830 at Angels Camp. The original schema was drawn by Mr. Perry in September 2000 and seems accurate, although I need to double-check and maybe take a couple pictures of the setup. I am using my new turnouts & blocks notation. When the T324 crossover is normal: Red rail power comes from the 322 toggle on the Mountain Panel, and black “common” rail power comes from the B321 common rail. When the T324 crossover is thrown: Power comes from the B830 block on the branchline (Angels Camp) for both rails. There is no common-rail connection with the mainline. On the Branchline Panel, there is a rotary toggle to select power for B322. As indicated in the panel description here, it is currently not connected to anything. An important difference I observed before was that rail polarity is inverted. It should match and yet clearly branchline was opposite of mainline at Angels Camp when I tested it. When the whole layout is unpowered, there is a very low resistance between both rails. That is not expected at all. Rail polarity is supposed to match here and be inverted at Rodgers Junction -- we need to remember the Branchline is essentially a long reversing loop. I did notice that the wires out of the Lenz LK100 (polarity reverser, see picture here) were opposite the input, and even after bypassing the LK100, it was still inverted. So something somewhere does not match expectations. A recent development is that throwing T324 right now shorts the branchline. This used to work a month or two ago. In between I fixed a broken solder on the Branchline side of T322 (denoted “AC Switch” on the schema above), but that is not enough to explain it. At first I thought it could have something to do with the opposite polarity of the branchline, but the schema above clearly shows there should not be any direct link between the branchline and the mainline at any time. 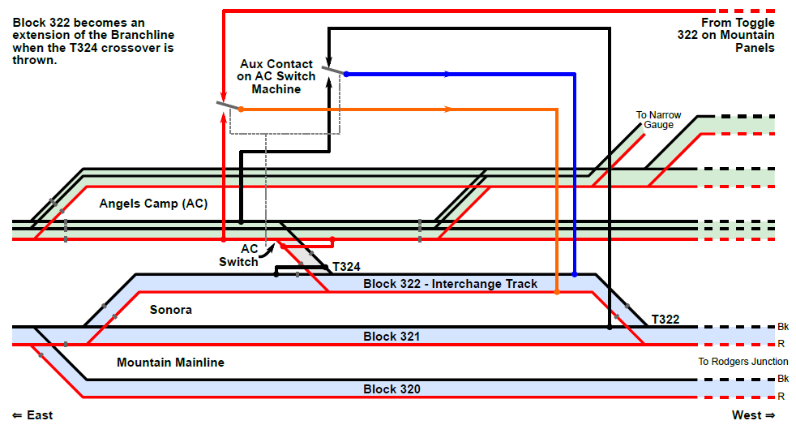 It’s important to realize that in a DCC world, the contact-switch scheme above that powers the B322 block either from one side or the other of the interchange track becomes pointless. In DCC, it can all become more simple with B322 always powered from the mainline (e.g. same as B321) and then the Branchline on its own booster. The booster boundary would be in the T324 diverging route, and trains would easily cross that booster boundary as long as rail polarity is the same. However the current scheme is not a bad decision in DCC and there’s some value in keeping it as-is if operator usage was to treat moving to the branchline in a 2-step process (e.g. move train to B322, realign mainline, then move to branchline). However this is not the behavior I’ve experienced. DCC operators typically ignore block boundaries and expect everything to seamlessly work automagically. I’ve done that myself. A typical usage scheme to move from the mainline to branchline is to have a train waiting on B321, throw both T322 and T324 turnouts and just zap along to the branchline. In the current wiring scheme, that means B322 becomes part of the branchline power, thus the booster boundary moves from T324 to T322’s diverging route. The bottom line is that although the double-step power scheme is nice, it is mostly ignored due to lack of actual “operation”. Good: Branchline has its own booster, and mainline has its own booster (already the case). Problem: Currently the whole branchline is powered through the LK100 polarity reverser. That is an odd design and one that needs fixing. [Task 1] To rectify this, simply remove the LK100, and later use it to control only a sub-section of the branchline. [Task 2] I should try to understand why the resistance between both rails is so low when there’s no power on the layout. The only way I know of doing that is by unplugging the DCC feed, and then starting isolating blocks one by one. Problem: Matching rail polarity at both junctions. The Branchline polarity should match with Sonora, and obviously be inverted at Rodgers Junction to match the mainline there. A block would be made in between that has the polarity reverser. [Task 3] Since this polarity match is expected but not observed, that would be the next thing to understand and fix. The polarity should be made to match at Sonora. Then I can take care of the Rodgers Junction side later. [Task 4] Next fix is to understand and fix the short that happens when throwing T324, as it is clearly not tied to the whole power scheme. It is possible it is tied to the dead spot I fixed by resoldering a joint (e.g. maybe I bridged something that was not supposed to be, yet that is not what the schema above indicates). The first thing to do is understand what is shorting exactly here as that is not clear and prevents from using the interchange.